“If you wanted to see real pomp, you should have seen the fair proclaimed” wrote Richard Holbeche in 1892, recalling the Sutton fairs of his childhood -the fair was a big event. Sutton’s town charter, granted in 1528, provided for two annual fairs to be held there. The Trinity Fair was held “every feast eve and morrow” of Trinity Sunday (eight weeks after Easter), while the other fair was held for three days at the feast of Saint Simon and Saint Jude, October 28th. There were to be no tolls at the Fairs, but the Warden’s accounts show that he expended 18 shillings at each fair in 1622; the 1646 accounts reveal that this was the cost of the dinners given by the Warden at the fairs -seventeen shillings at Trinity and twenty-three shillings at Simon and Jude. Horses were traded at the fairs, and by 1646 a fee had to be paid to the Warden for each transaction - £1.15s was collected in 1646. Most of the horse-traders came from the neighbouring counties of Staffordshire, Worcestershire and Warwickshire, to judge by the surviving records of six fairs in the 1750s, but some came from as far away as Newport in Shropshire and Grantham in Lincolnshire. There were only seven transactions at the Trinity Fair in 1750, but 32 at the 1752 Trinity fair, prices ranging from £1.1s.0d. to £6.6s.0d. 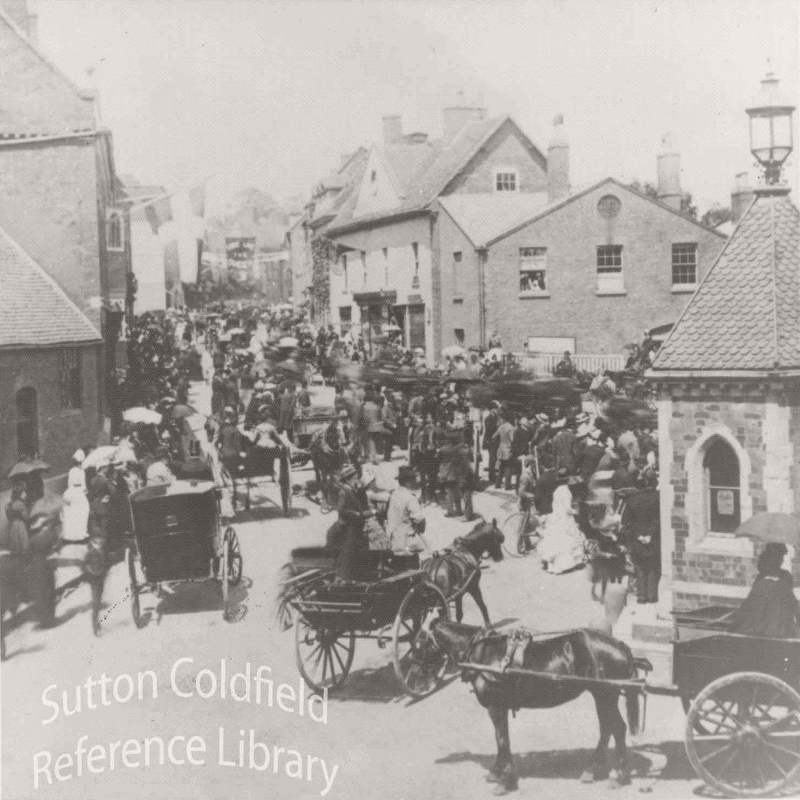 Though not on the scale of the Nottingham Goose Fair or the Lichfield Bower, the Sutton fairs were lively enough. Sheep pens lined the streets, and cattle, sheep and pigs were driven here and there. Horses trotted up and down the horse fair (Lower Parade), and booths and stalls were set up wherever a space could be found, selling sweets and nuts or housing sideshows of freaks, wild animals or shooting galleries, all the stallholders shouting their wares in loud voices. “And the omnibus from Birmingham, crowded inside and out, would come toiling up the hill, with its four steaming grey horses”, as Richard Holbeche recalled. no pictures of the fairs survive, but this crowded scene at the top of Mill Street shows where the fair was set up.